No, this is not a New Years resolution, but perhaps more of a slant to a lifestyle change. The last week or so I have had the luxury of slowing down a bit. How does one do this with Christmas in that very same week? Easy, I did ALL of my shopping online, so there was no traffic and shopping mall hassles for me. Additionally, I took the time to have dinner with some friends and my god child. It was all easy-peasy. Once you have a chance to do this, you are really able to see how fast the world is moving around you. Christmas has come and gone and Santa threw a little wrench into my easy-peasy week by delivering an 8 week old Cavalier King Charles Spaniel. This house is starting to feel like we just brought home another child! Anyhow, it was the delivery of this new friend of ours that has prompted the thought process that started this post. As I sit and watch the children get acclimated to having a puppy in the house, I realize just how fast time is moving and how the world around us only seems to find ways to make it faster. It was not all that long ago, that we were baby proofing the house for the first child, and now that very same you man is tending to a puppy. So what does all this have to do with photography? Well in an effort to slow things down a bit and to "see" the world around us. I will try once a month (maybe once per quarter) to post a back to basics that will help you do just that with your photography. For January, lets start of the month with your brand new camera that Santa just delivered. Whether you are a season photog or just starting out. I encourage you to learn the basics of the camera. In order to do this, one must understand the two things that influence the resulting image, light and time. How much light you let enter the film plane (nowadays called the sensor) and for how long you let that light through. So, I challenge myself and anyone reading this to resolve to use nothing but manual mode on your camera for the entire month of January. I do understand that if you rely on photography for more than 20% of your annual income, this may be a sketchy proposition, so you may be excused. However, I will almost ensure you, that should you embark on this challenge, your images the rest of the year will be much more predictable. Sure, a lot of you read articles that say digital storage is cheap, just bracket bracket, shoot change modes, adjust aperture shoot some more, and before you know it you have 40 shots of the same thing all with different results and you don't know what worked or why. Did you catch the shot? Well likely you did, but only because you increased the odds, not because you understood the science behind it. Yes, there are quite a few times, when getting a quick shot, fly by, or something else that happens instantly that you might not have the time for determining the exposure while in manual mode, but I contend that if you can find the time to slow down put the manual mode to the test, next month when you go back to aperture priority, you will actually read the meter and think about the exposure that the camera is suggesting. So, in summary, Slow Down! Think about the light, the exposure, and see if you can get close with just manual settings, then tweak them from there, you will hopefully thank me later, and those that view your images, will thank you also. Feel free to post comments and let me know how it is working for you. Hope everyone had a Merry Christmas and has a safe New Year. I came across this idea while reading about a few shooting assignments. Contrast was the assignment. While doing some golf practice with my son (he plays better than most) he showed me what he learned at golf camp, how to balance a golf ball on top of another. 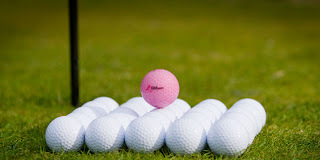 Yes, I just happened to have pink golf balls on hand, since my daughter has picked up the game also. At the prompting of Brian over at Epic Edits, I started thinking about images that I could put online, not only for viewing enjoyment but for possible Artwork Sales. I am experimenting with the Imagekind Service, you can see my gallery here. In order to utilize the flash very well for off camera, it is necessary to change the default functions. 1. Press the illumination/C.Fn button on the back of the 580EX II for at least two seconds until the speedlite’s display changes. 2. Turn the flash unit’s control dial until “Fn 05” (speedlite Custom Function 5) appears. 3. Press the speedlite’s SET button to make the second digit blink on and off; while it is blinking, turn the control dial on the flash unit until option 3 appears (Fn 05-3). By doing this, you have now set the flash to perform standard, traditional external flash metering. This can be done with any EOS SLR, film or digital. I started gathering enough info, links, etc that the photography section kind of took over my other blog. So I have started this and will be moving things over here. The tag line says it all.. Powered by Passion. Currently residing the in the Metro Atlanta area.